EPractize Test Lab - Free SCEA Practize Test 1.0 is computer software developed by EPractize Labs Software Private Limited. Key features include the following. FREE Test environment suitable for certification test, quiz test and practice test. Load new tests based on your preference. Create many user profiles in a single system and EPractize Test Lab maintains each user reports separately. After completing the tests, you can export the reports to your mail. This education program is freeware, so you can download and use it absolutely free. 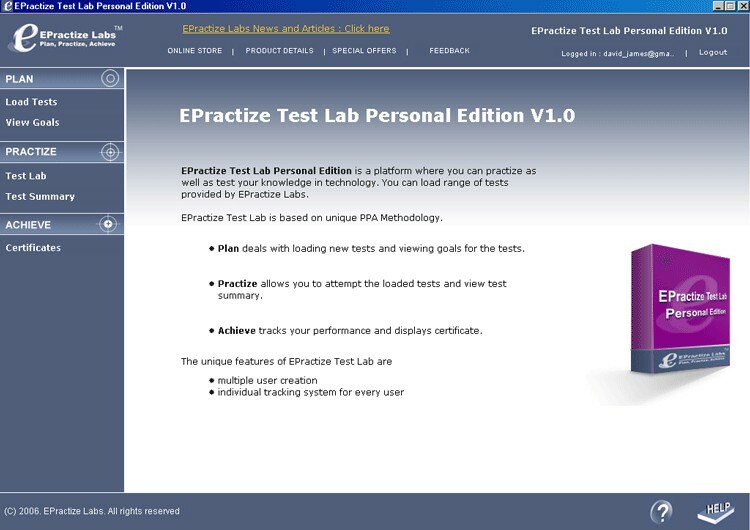 EPractize Test Lab - Free SCEA Practize Test 1.0 supports different languages (including English). It works with Windows 98/XP/Vista. Latest EPractize Test Lab - Free SCEA Practize Test 1.0 does not contain any spyware and/or advertise modules, allowing installing it with no worries concerning valuable information loss. We has completely tested computer software EPractize Test Lab - Free SCEA Practize Test 1.0 many times, written and published the interesting article and uploaded installation file (16384K) to our fast server. Downloading EPractize Test Lab - Free SCEA Practize Test 1.0 will take several minutes if you use fast ADSL connection.